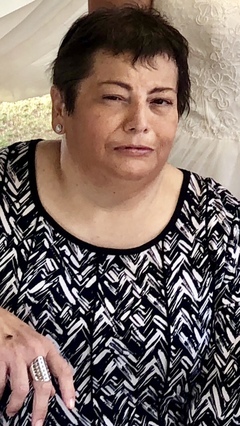 Gina Marie Godinez,45, passed away Saturday, October 13, 2018 in Lubbock. Services for Ms. Godinez will be 10:00 am Thursday, October 18, 2018 at Our Lady of Guadalupe Catholic Church with Father Martin Pina officiating. Burial will follow in The City of Lubbock Cemetery under the direction of Broadway Funeral Directors. Gina was born June 29, 1973 in Lubbock to Richard & Mary Helen Godinez. She graduated from Coronado High School in 1991 and was a home maker. She enjoyed reading, cooking, dancing and spending time with her family. An unselfish soul, Gina loved taking care of others always putting aside her own difficulties. She is survived by her mother, Mary Helen Godinez of Lubbock; two brothers, Michael Godinez and wife Elizabeth, Gary Godinez & wife Gena all of Lubbock; one niece, Leticia Keng & husband Wesley; four nephews, Nicolas Godinez & wife Breanna, Nathan Godinez, Samuel Godinez, Benjamin Godinez; four great- nieces & nephews, William, Alexander & Violet Keng, Townlie Godinez and a furry companion, Gino. She is preceded in death by her father, Richard D. Godinez.